ESL Worksheets eBook - These free eBooks have 10-20 printable worksheets with short stories for beginning to intermediate level ESL students. All the images are black and white so they print clearly. The books are being released under Creative Commons License 3.0, so you are free to make photocopies or even upload them to your own Web Site as long as you give credit to their creator and don't change the content. Each story covers a life skill subject like family, transportation, health, employment, technology, etc. Crossword Puzzles - Crossword puzzles provide a fun and easy way for ESL students to improve their vocabulary and spelling skills. The intellectual stimulation provided by solving crossword puzzles keeps students focused and engaged while creating a joyful atmosphere in the classroom. If the puzzle clues prove too difficult for your students, you can always make things easier for them by writing the words from the answer key on the board. Allowing students to work in pairs will also make solving the puzzles faster and easier. Read Aloud Worksheets - Reading aloud helps ESL and K-12 students improve their verbal fluency and pronunciation skills. Students can read aloud in pairs, in small groups, to the whole class, or to several classes. It is best to practice these worksheets chorally with the class before putting the students in pairs or groups. A fun variation is to divide the class into two groups and have them stand in two circles, an inside circle and an outside circle. After partners have practiced reading aloud, the teacher can blow a whistle as a signal for the outside group to circle clockwise and read aloud to a new partner. Vocabulary Match - ESL students can easily complete these simple vocabulary ESL worksheets by using a dictionary or an electronic translator. 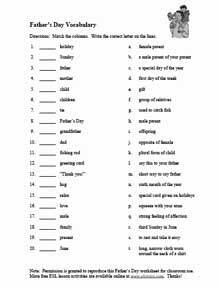 The lessons can be expanded by instructing students to turn their papers over and write one sentence for each of the twenty words in the first column. Most experts suggest reading the words aloud to the class before students tackle the writing part of the assignment. Cloze Exercises - Funny pictures and interesting stories make these cloze exercises enjoyable. Students listen and write the correct vocabulary words on the blank lines as the teacher reads the stories aloud. After they have checked their worksheet, students can practice reading the story with a partner. 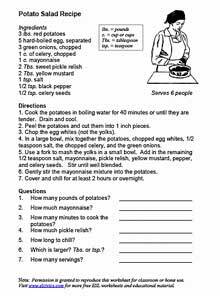 Life Skills Worksheets - Life Skills are basic everyday skills like reading charts, schedules, recipes, and completing forms. Most adult ESL programs assess students with life skills tests to discover what level English as a Second Language class they need. After students complete a designated amount of instruction, they are given another test to determine their progress. Funding for ESL programs is largely based on the benchmark gains that students make on these tests. The free ESL worksheets found in this section will help students improve their performance in completing life skills tasks. They can be downloaded and used in class or passed out as homework assignments. They can also be shown on interactive white boards. ESL Grammar Worksheets - Adults learning English will find these beginning-level worksheets easy to use and easy to understand. Each worksheet is limited to just one or two teaching points and the exercises are repetitive. Intermediate-level classes can use them for a quick review of the basics, especially at the beginning of a new term or school year. Handwriting - Tracing develops the small motor skills needed for mastery of handwriting. It allows literacy students to practice holding and using a pencil or pen. The worksheets here come in two types: printing and cursive. All the fonts are clear and clean, and some of them have lines to help beginning students write straight. 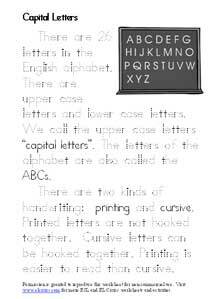 Be sure to review basic letter formation to reinforce the proper strokes to use when writing. If you read these worksheets aloud to the class, they can also provide listening practice. You might want to have the students practice reading the worksheets aloud to each other. 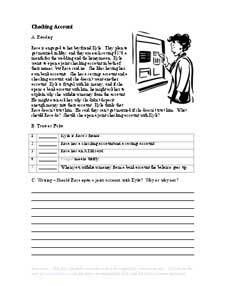 Writing Worksheets - The blackline pictures at the top of these worksheets provide a fun and easy writing prompt for multi-level classes. Beginning students can create short descriptive sentences while intermediate students can write more elaborate sentences. After the students complete the writing assignment, they can share their sentences and stories with a partner. Some classes might want to color the pictures and display them on the wall or in a group portfolio notebook. Blank Maps - Maps show the physical and political boundaries of states, countries, and places. The maps in this unit can be traced, labeled, and colored. They also make great report covers for geography homework assignments. Some of the maps are in worksheet format and include lesson exercises. Copyrights to the pictures and photos on this EL Civics and ESL website belong to individual photographers. We have purchased the rights to use them. Permission is granted to copy any of the ESL worksheets for classroom or home use. Contact teacher Christina Niven at christina@elcivics.com. Please send requests for new worksheets. Copyright © Christina Niven, 2007.